Karabakh horses are a mountain breed from Azerbaijan. They have many of the same traits as some other breeds, such as the Arab and the Akhal-Teke. They are one of the very few breed that have a iridescent and shiny coat; like Akhal-Teke horses. At one point Azerbaijan was invaded and the horses used because the descendants of karabakh horses. Around the seventeen and eighteen hundreds, Karabakhs, numbering around four thousand. Soon, they became populare in Europe and Russia as well. In 2004, one of these horses earned themselves a speed of one minute and nine seconds for completing a one thousand meter sprint. You can find theses horses in a place called Azerbaijan, but do keep in mind only a choice few out of thousands of those will be total thoroughbred styles. The Karabakh horse breed is an animal that is utilized for riding and harness work. They were also used for racing, as many do not realize the amount of speed this horse can provide. Known as great racing or competition horses, the Karabakh is quite agile. Additionally, they are sporty and tough. They have been found in Iran, Armenia, Turkey, Russian Federation, Baku, and other areas along the Caspian Sea. 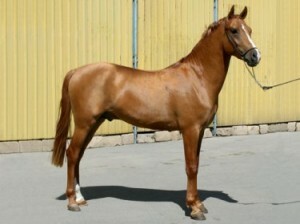 They can also be found on farms, such as the Gunay Horse Farm located in Baku, an area in Azerbaijan. The Karabakh horse breed is very patient and kind. They are gentle, sweet, and do not act on their emotions like some horses tend to. While they are timid at times and can be relatively sweet, they are also the type of horse that can be exceptionally brave and worthy of having some responsibility. With beautiful coats and small heads, the Karabakh breed is elegant and very strong. They have a low set tail and muscular quarters. They bode an iridescent coating all over and have a glow about them that is not like the other breeds. The Karabakh is alert and expressive. Generally, they do not have full manes or very long tails. Some experts have remarked that this breed does not have the ‘dishing’ in their profiles, like most of the Arab styles do. These horses are somewhat simplistic to tend to. They are so calm that they do not need much supervision. No major illnesses have been noted on this breed and they are somewhat independent animals.